In my last post, I mentioned Print Gocco. It wasn’t long before I received email asking what it was. Let me introduce you to one of my favorite tools. Print Gocco is a Japanese color screenprinting system developed in 1977. It is a compact and completely self-contained printer. 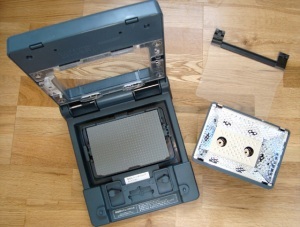 The system works using flash bulbs, a carbon-based image or photocopy and an emulsion-coated screen. When the bulbs are manually flashed, the carbon in the drawing or photocopy burns the screen into a stencil. Several colors of ink can then be applied at one time and multiples prints can be made. Immensely popular in Japan – it is said that at the peak of its popularity, nearly 30% of Japanese households owned one! Print Gocco have since been discontinued, see SaveGocco.com for more info. There are a few different models on the market, check out eBay, you may find one there if you are lucky. I have a PG-11 .. and I LOVE it! Quite honestly, the possibilities are endless. Simple cards that a child could do, or more creative projects, like the purses I made (see earlier post). I have gocco-ed fabric, paper napkins, books, leather, felt and more… let me know what you have gocco-ed. Ohh.. and by the way, for the purses, I used 4 different screens, each one with a design I sketched by hand. Check out the gocco items on etsy to see what other people are doing with it. Take a look at this Etsy video to see how the Print Gocco works. You can make things as simple or as complicated as you like. It is great fun either way!